Back in the 1940s and 1950s, my maternal grandmother used to make a jellied cranberry mold which my mother kind of insists on. No one likes it or eats it, but it's a tradition and incredibly, weirdly retro. It’s also a lovely color and is sort of a centerpiece unto itself. My father, God love him, likes the jellied cranberry sauce, the kind that comes out in the shape of the can. 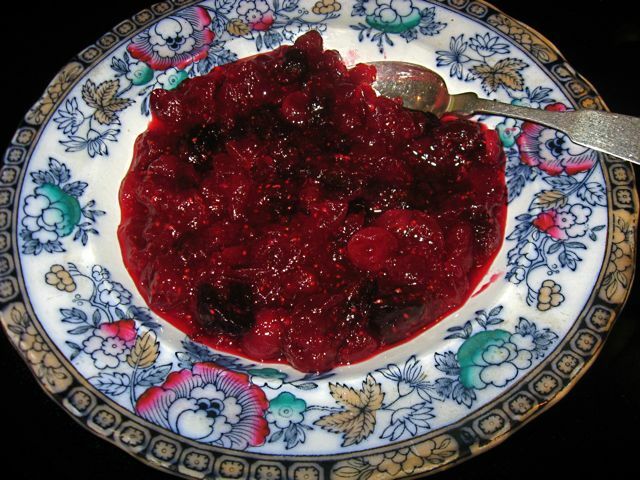 Then there's the homemade cranberry sauce that people actually eat. This varies each year according to my whim (since I'm the one who makes it). This year’s model features cranberries with orange and figs. The tart berries pop in the mouth, the figs provide chew and sweetness, and orange ties it all together in this easy-breezy spin on a Thanksgiving classic. Combine all the ingredients in a large saucepan. Bring to a boil, stirring, until the sugar dissolves. Reduce the heat to medium and cook, stirring occasionally, until the berries burst and the mixture thickens, about 7 minutes. Remove from the heat. Allow the cranberry sauce to cool. Transfer to an airtight container and refrigerate. This sauce will keep, covered, in the fridge for two weeks.